The idea that we live in an expanding universe is one of the most unexpected and important discoveries of 20th century physical science. For tens of thousands of years, everyone, including astronomers, had assumed that the universe was a stable, unchanging stage on which astronomical events played themselves out. But in the 1910s and 1920s, several physicists and astronomers made several discoveries that defied easy explanation. These discoveries came together in the mind of an astronomer named Edwin Hubble, who explained all of them in 1929 with the expanding universe theory. In this project, you will retrace Hubble's steps, seeing the same bizarre phenomena that he saw. You will discover for yourself that the universe is expanding. Hubble's discovery came after 15 years of lucky alignment of theory and observation. In 1915, Albert Einstein developed the General Theory of Relativity, which explained how gravity works. When Einstein applied the theory to the whole universe, he found that it made a strange prediction: all of space should be dynamic, either contracting or expanding. Einstein refused to believe his own equations - like all astronomers for thousands of years, he had assumed that the size of the universe was not changing. Meanwhile, on another continent, Vesto Slipher, an astronomer at the Lowell Observatory in Flagstaff, Arizona, was finishing a detailed study of the night sky. He examined several of the faint, fuzzy "nebulae" that he saw in his telescope. He carefully measured the nebulae's spectra - the amount of light they emitted at different wavelengths. He found that the spectra of nearly all of them were "redshifted" - their light was redder than it should have been. 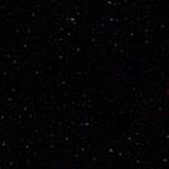 Slipher knew that when an object's light was redshifted, it was moving away from Earth, and that the object's speed was proportional to the redshift. He calculated the nebulae's speeds, and found they were all moving away from us incredibly quickly: one, the Sombrero Nebula (known today as the Sombrero Galaxy), moved away at 2.5 million miles per hour. Meanwhile, astronomers in California were building the largest telescope in the history of the world - a new telescope on top of Mount Wilson, near Pasadena, with a mirror 100 inches (2.5 meters) across. In 1923, Edwin Hubble used this new telescope to prove that some of the nebulae, including the Sombrero, are actually other galaxies similar to our own Milky Way. He spent the rest of the decade looking through the telescope, trying to find creative ways to measure the distances to hundreds of galaxies. In 1929, Hubble compared his distances to Slipher's measurements of redshift and made a famous plot, which today is called a Hubble diagram. Hubble's diagram showed that a galaxy's redshift increased linearly with its distance from Earth. The farther away a galaxy is, the faster it moves away from us. The simplest explanation for Hubble’s observation, and the one that Hubble himself offered, was that the entire universe is expanding, just as Einstein's equations predicted it should. When Einstein heard about Hubble's results, he said that not realizing the expansion of the universe was his "greatest blunder." If the universe is expanding, then at some time in the past, it must have started from a single point - an idea known as the big bang. Hubble's discovery, and the later development of the big bang theory, changed astronomy forever. Observation 1 is a necessary consequence of the big bang theory, but it could be argued that it is just a coincidence. But there are no viable alternative models to account for observations 2 and 3. Good theories are useful theories - they make connections between diverse sets of information and help to illuminate a wide range of phenomena. On this basis, the big bang picture has been one of the most successful theories in astronomy. In the pages that follow, you will retrace Hubble's steps to make one of the most important discoveries of 20th century astronomy. 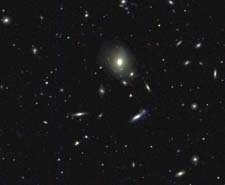 First, you will look at a few galaxies in the SkyServer database. You will measure their magnitudes to get a rough idea of their distances. You will use these distances, along with SkyServer's measurements of the galaxies' redshifts, to make a simple Hubble diagram. Then, you will look in detail at some of the ways astronomers calculate the distance to galaxies, and you will learn how to find redshifts yourself. You will put this knowledge together to make a Hubble diagram the same way that Hubble did. Last, you will go back to the SkyServer database and look for galaxies on your own, making a Hubble diagram that no one else has ever made. Click "Next" to begin the journey.